Brazil play Uruguay at the Emirates stadium in London tonight in what will hopefully be an exciting game. But where is Tite taking this new Brazil team? On paper, with four wins in four games – including a win against Argentina – the Seleção has made a great start to life after their World Cup exit to Belgium. But the recent performances against Argentina and Saudi Arabia were disappointing, while Tite’s team and squad selections have lacked ambition. I don’t see much progression. And more worryingly, the coach seems to be prioritising next year’s Copa America over preparing a team that will be able to beat the rest of the world in Qatar in 2022. Brazil deserved to beat Argentina, even if it took a last-gasp goal from Miranda to seal the win. But this was delivered without the usual swagger of a Brazilian team: despite the team being at full strength and without many changes to the team that started in Russia, the team’s moves rarely flowed. Argentina were missing their best players (Messi, Aguero, Higuain and Di Maria) and took to the field with several players that I’ve never even heard of. There was a big gulf in class between the two teams, but Brazil didn’t drive home their superiority. And this wasn’t a one off either: they laboured to a 2 – 0 win against Saudi Arabia a few days earlier. Its not east being the Seleção coach with a demanding public, and annoying bloggers, scrutinizing your every decision. Despite this, and the sky-high expectations, the public are on Tite’s side at the moment. He deserves this in my opinion, after a brilliant World Cup qualifying campaign, the valiant effort of his players in defeat against Belgium and the massive improvement from the terrible reign of his predecessor Dunga. But I am starting to become worried about his short term thinking and focus on results, even in friendlies. The goodwill of the Brazilian public will not last too long. Rather than winning the Copa America next year (hosted by Brazil), I think the public would rather see their Seleção playing attractive, attacking football. And they will want to convinced that they are building a competitive team for the Qatar 2022. 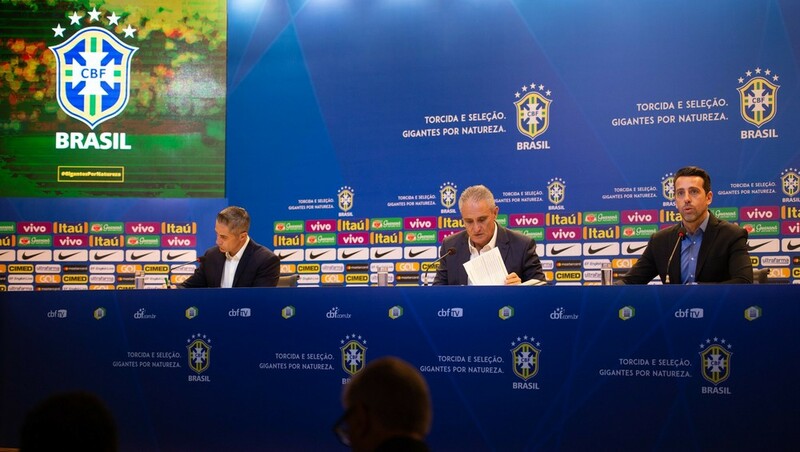 By prioritising results now, Tite may ultimately be making his own job more difficult. He ought to be thinking further down the line, especially after he was given a four year contract. In practical terms, this means that players like Renato Augusto and Paulinho should have no place in this Brazil squad, especially with quality young players coming through in those positions. (For some reason Tite has opted for Paulinho in his squad for the upcoming games). Performance wise, I haven’t seen much progress either. There have been a few positives: Richarlison has made the most of his chance, and Arthur turned in a tidy performance against Argentina. Douglas Costa’s scintillating turn of pace and cross to set up Firmino’s goal against the USA was also a highlight. On his day, Costa is a world beater, btut he has shown bad discipline at Juventus (by spitting on an opponent) and he cannot get into their starting XI at the moment. The problems aren’t limited to Douglas Costa. Gabriel Jesus is out of sorts, for club and country. Richarlison, as well as he has played, is not the answer at number nine. Tite’s decision to play Gabriel Jesus and Firmino in the same team didn’t work against Argentina. And there are problems in defence: Thiago Silva and Miranda are not getting any younger. Marquinhos lacks presence and is prone to the odd mistake. And at full back Felipe Luis and Alex Sandro don’t offer much going forward, compared to Marcelo, who has suffered a dip in form this year. On the other flank, Dani Alves is injured, and getting old, while Fabinho and Danilo are not getting much game time for their clubs. Fagner isn’t a long term solution either. The Brazilian fixture list isn’t helping. Since there is no break in the domestic calendar for these international matches, Tite has resisted calling up the best players playing their football in Brazil (the likes of Lucas Paqueta and Everton) for the games against Uruguay and Cameroon, or the previous games against Argentina and Saudi Arabia. But even when Tite did have the chance to give them minutes against the USA, earlier this year, he used them only sparingly. This entry was posted in Qatar 2022, Seleção and tagged Arsenal, Copa America 2019, Emirates Stadium, Tite, Uruguay by Brian Davidson. Bookmark the permalink.